Films are not truly preserved until they can be seen again by the public—for study, education, and enjoyment. All organizations receiving NFPF support make their films available for research. Many also exhibit them in their own theater or displays, via loans and commercial bookings, through video releases and broadcasts, and on the Internet. It is access that completes the preservation process. With this in mind, the NFPF is proud to present selected films made available through our programs. Please enjoy our curated programs below, click here to browse and search all of the films viewable on our website, or click here for a list of more than 230 additional films available for viewing outside of the NFPF website. Made by corporations, schools, medical organizations, religious groups, political entities, and others, sponsored films were produced to record, orient, train, sell, and persuade. Presented here are 159 of the 452 titles showcased in Rick Prelinger's Field Guide to Sponsored Films. In 2000, 18 of America's premier archives joined forces with the NFPF to release preserved films from their collections for the first time on home video. The resulting 4-DVD set showcased the incredible diversity of American filmmaking and launched the award-winning Treasures DVD series. We are pleased to present this long out-of-print set on our website for the first time. 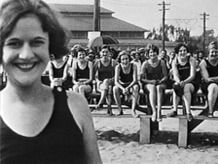 Through a multi-year collaboration involving the EYE Filmmuseum, NFPF, Library of Congress, Academy Film Archive, Oregon Historical Society, and National Museum of American History, scores of “lost” American silent-era films are being returned to the U.S. and shared online with audiences around the world. More will be added to our site in the months ahead. Lost for decades, the movies planned by Orson Welles for the Mercury Theatre’s 1938 revival of Too Much Johnson, by William Gillette, resurfaced in Italy and were preserved through an NFPF grant to George Eastman House, with the Cineteca del Friuli and Cinemazero. Presented here are the work print along with a “reimagining” of how the films might have been put together. Thanks to a collaboration involving the New Zealand Film Archive, the NFPF, and the largest American nitrate archives, scores of “lost” American silent-era films are being returned to the big screen and shared with new audiences. Sample a selection here. Through a partnership with the National Film and Sound Archive of Australia begun in 2008, the NFPF helped preserve and make available American silent films that have been unseen in the United States for decades. Six are viewable here, including Mutt and Jeff: On Strike and a U.S. Navy documentary. Newsreels, industrial films, cartoons, films from the silent era, political ads, home movies, avant-garde works—nearly 2,400 films have been preserved through the NFPF programs over the past 20 years. Here are examples saved by archives across the United States.